Potatoes – Potatoes are a great source of vitamin C, and they help bind all the ingredients together in these nuggets. Carrots – Carrots are a good source of Vitamin A. Most kids like them raw, but this is a good way to introduce cooked carrots as well. Peas – A good source of Vitamin K and Maganese. 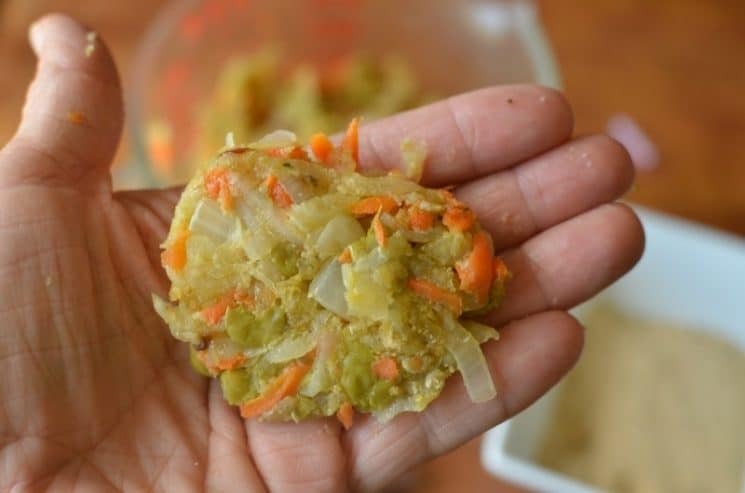 We always have peas on hand in the freezer, and they are a great addition to any meal. Onions– These are a great way to get quercetin, an antioxidant good for kids. Onions also provide flavor to these nuggets as well. Garlic – More flavor from garlic, but garlic is also a good source of the antioxidant Allicin. 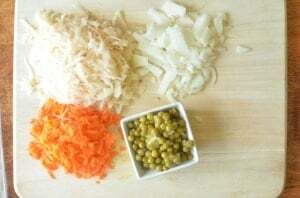 1) Start with shredding potatoes, carrots, chopping onions, and defrosting peas. The kids can help with shredding or pealing the potatoes. Shredding the carrots for kids who are a little bit older, and chopping onions for the oldest kids. 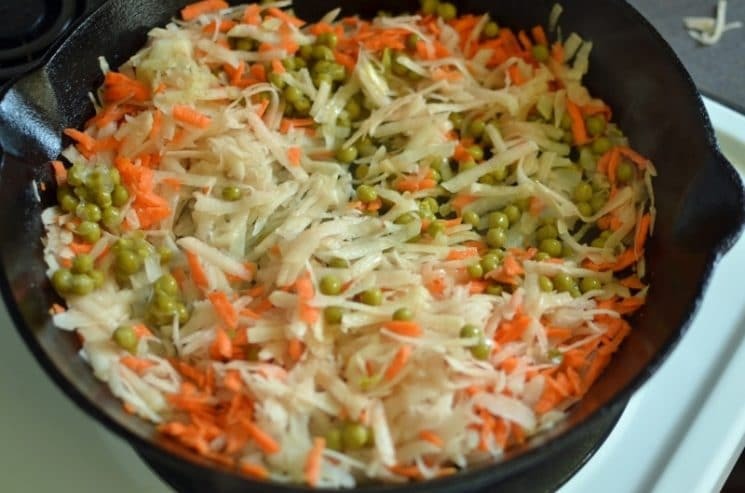 2) Cook veggies in a skillet until they are soft and tender. These cook quickly if they are shredded with a cheese grater! Let the kids stir the veggies in the skillet. 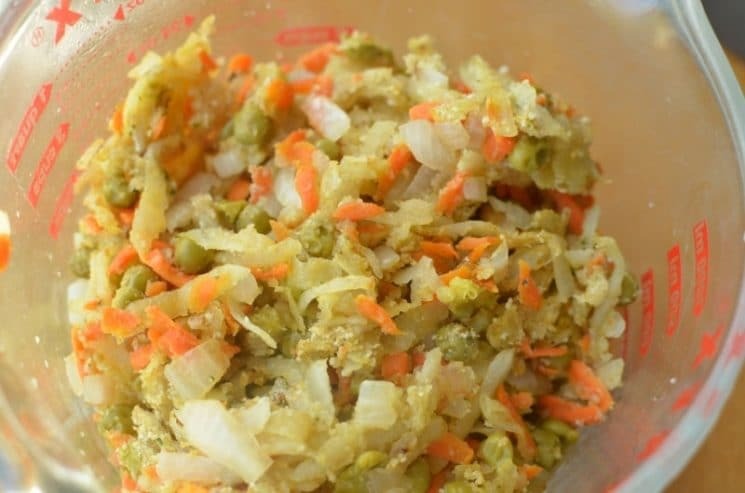 3) Add bread crumbs to veggie mix. Dump in the bread crumbs. The kids can do this task. 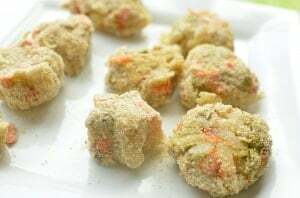 The bread crumbs can be substituted with gluten free products or even oats. 4) Chill in fridge until easy to handle. Chilling is great because you can mix this up in the morning, and it will be ready to make into nuggets at lunch time or dinner. Store for several days if you need to! You can also make fun shapes from the nuggets using cookie cutters. We’ve made stars before and even hearts. 6) Roll in breading and cook. That’s it! We love these hot and right off the griddle, but you can chill them and reheat for another day. Let us know if you try these and how your kids like them! Dice onion, shred potatoes and carrots, and mince garlic. Heat 2 tablespoons olive oil in a medium skillet, then add diced onion; cook for 2 minutes or until softened. Add potatoes and carrots; continue to cook for 5 minutes, stirring frequently. Mix in garlic, peas, salt, and pepper; continue to cook for 3 minutes more. Remove from heat, stir in juice from the lemon and 1/4 cup breadcrumbs; set aside until mixture is cool enough to handle. 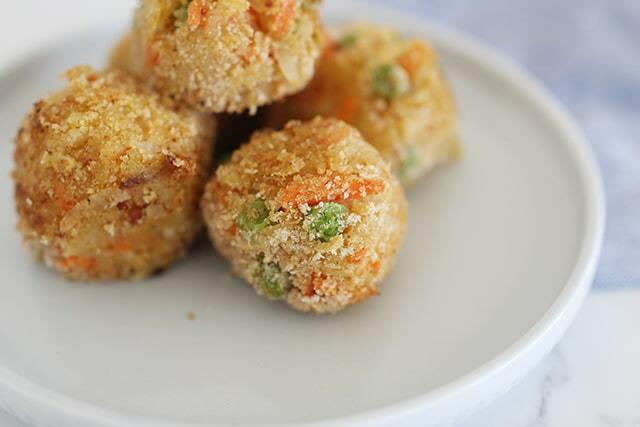 Shape veggie mixture into 15 to 20 balls; refrigerate for at least 30 minutes. Place remaining breadcrumbs in a shallow dish. Heat remaining olive oil in a skillet over medium-high. Roll the balls into the breadcrumbs until coated on all sides. Add 4 to 5 nuggets at a time to the hot skillet and cook for 2-3 minutes on each side until nicely browned. 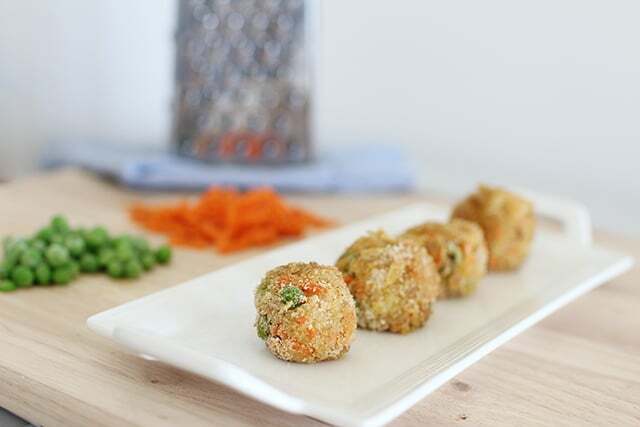 Drain on paper towels and repeat the process with the remaining veggie balls until all have been cooked, adding more oil as necessary. Have you ever tried baking these? I bet your kids will like it Rachael! Can you blend it all together? My daughter won’t eat them if she sees all the chunks. Sure Kim!! IF you have a good food processor, you totally could do that! Hi, can you freeze these? Yes you can! Just reheat in the oven so they return to their crispiness! How long did you baked them & what temperature? This is a great idea! Do you think green beans would work instead of peas? My lo is not too crazy about potato either, but loves carrots. Do you think it would still hold up without as much potato? Do you think these would cook well with Coconut or Avocado Oil? 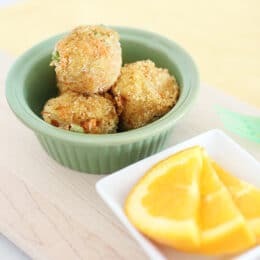 Will Panko bread crumbs work in place of regular? Thanks! 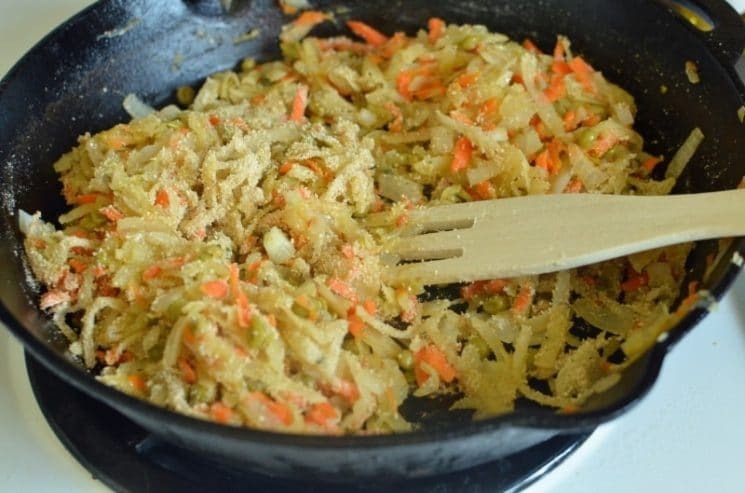 I love vegetables, however, add breading and fry in fat and anything will tastes great. Is the potato cooked? If so, how did you shred it without it falling apart? @Ashley- I do. Beans might even taste a little better (more like falafel). @Katia – coconut oil would work great- I have never used avocado oil. @chris- Yes! Crunchier, but probably awesomer. @sadi- they are cooked. You shred raw, and then cook them. @Katie- I’ve never frozen them. I would cook it first, then freeze. Just reheat on a skillet or the oven so they stay a bit crispy. What temp and how long do you bake them for, to reheat them after they have been frozen? @Rheanna- I would bake them at 425 for about 10 minutes if they are small enough to cook through. How ong it will ast?? how long it will ast??? Appreciating the dedication you put into your blog and detailed information you present. It’s awesome to come across a blog every once in a while that isn’t the same old rehashed material. Great read! I’ve saved your site and I’m adding your RSS feeds to my Google account. I like what you guys are usually up too. This type of clever work and reporting! Keep up the superb works guys I’ve included you guys to our blogroll. 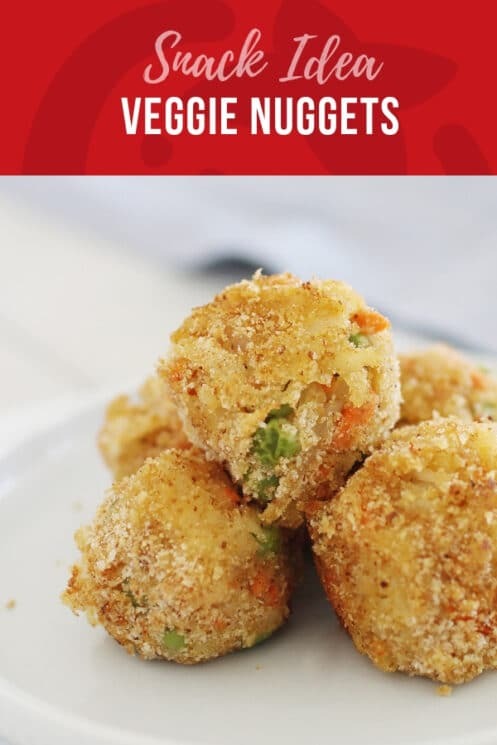 I want to try these in my air fryer! Its look delicious. Thanks for this easy recipe. I love this idea! Thoughts on using sweet potatoes instead of russet? What about adding broccoli? And any idea how pureeing the veggies would turn out? Thanks! I think sweet potatoes would be a terrific swap! Also, adding broccoli should be great.